My main interests are book collecting as a hobby, vocation, and/or disorder of mind and private library development. Book collecting and private library development, while certainly related, are different. I'll be writing about books I love, books I collect, books in my collection, new books, old books, banned books, illustrated books, rare books, libraries, books as art and artifact, and anything else related to books that captures my attention. I have to admit a problem, my addiction to the contemporary graphic novel is becoming serious. The graphic novel today is the comic book of yesterday. Collecting comic books is big business now and prices are rising quickly. It certainly seems more appropriate to be interested in a graphic novel rather than a comic. Don't you think? My interest in the graphic novel is not really new but the growing interest in acquiring more first edition first printing of the graphic novels being published today is. I used to be simply amused by the graphic novel, now I need to add and own works for my collection. Perhaps my current interest is a coping mechanism since I know I can't afford to collect Medieval illuminated manuscripts or the modern fine press facsimiles of these rare books. I've collected many of the affordable facsimile editions but to satisfy my desire for more, I'm finding succor in the healthy supply of newly published graphic novels. I do try to control my wants and I have even tried to determine whether or not the graphic novel is best enjoyed electronically. This seems a natural experiment pitting traditional print publication against electronic publication. My experiment began last year by following the fictional biography of Machiavelli being produced and published online by Boston artist Don MacDonald. He began publishing his biography in February of 2010 with plans for a total of 170 or so pages, a new page appearing every Tuesday and Friday. MacDonald has covered all the access bases including an easy to follow website, RSS feed, Facebook and Twitter accounts. I visit the website once a week to read the new pages. His writing is crisp and enjoyable, includes many links for additional information and his illustration are masterful. I enjoy his project and only lament the fact that it would simply be better as a print book. Anyone interested in comparing an online experience with a print experience could do no better than take a close look at The Odyssey: A Graphic Novel by Gareth Hinds, Based on Homer's epic Poem , Candlewick Press, 2010, which I received as a Christmas gift. A stunning publication with lovely illustrations, great story telling and a pleasure to hold and read. This is a fine addition to my private library. Comparing the two is not totally fair but compare I do. I get much more pleasure owning the book and having it become an artifact of my life. 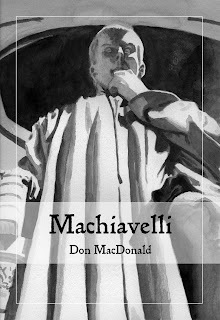 I just can't get that excited about an electronic publication, even one as well crafted as MacDonald's Machiavelli. Both artists are from Massachusetts and I do hope they continue to prosper and push the frontier. I will continue to follow Machiavelli by MacDonald online and I will now need to collect Hinds' three previous graphic novels, beginning with Beowulf . Luckily I just ordered a signed hardcover first edition first printing for $5.49 plus shipping, an easy fix! “Victoria” is focused on the Great Exhibition for the finale this Sunday. Don’t miss it, and don’t miss our book on the photography of that event! Ethereal theme. Theme images by luoman. Powered by Blogger.